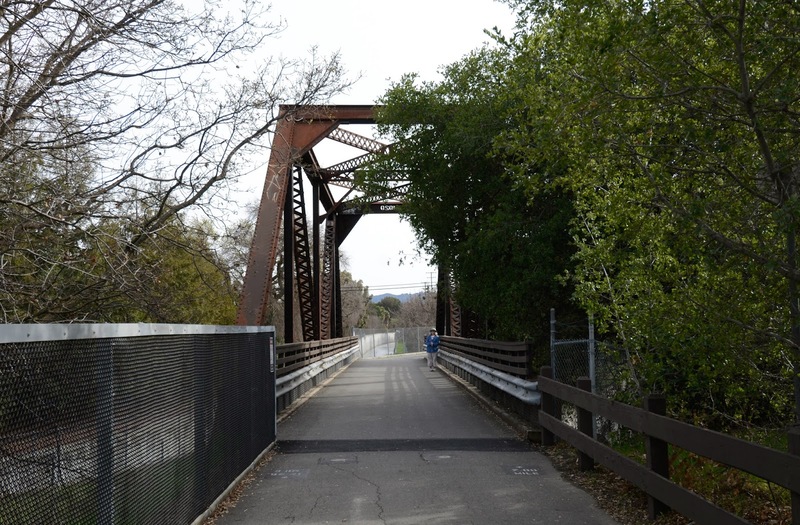 The Iron Horse Trail has a number of older bridges from when the trail was a railroad line. Today's bridge is a four panel Pratt truss with diagonal members sloping towards the center in tension. The bridge crosses over Walnut Creek, which is a concrete-lined channel covered with warning signs due to the danger of flash floods and drownings. This bridge was built in 1929 and has the date stamped on the portal frames at the ends of the bridge. It's 102 ft long, 18 ft wide, and made up of wide flange compression members and laced tension members. The Ygnacio Valley Road POC is just north of the Walnut Creek Bridge and a little to the side to allow people to continue on or off the trail as shown in the photo below. Contra Costa County, California Bridges: Iron Horse Trail Bridge across Walnut Creek by Mark Yashinsky is licensed under a Creative Commons Attribution-NonCommercial-NoDerivatives 4.0 International License.